Roadrunner... Did you know? The roadrunner is the State Bird of New Mexico. Few creatures can outrun a roadrunner, which is often seen zipping across the desert at 15 miles per hour. 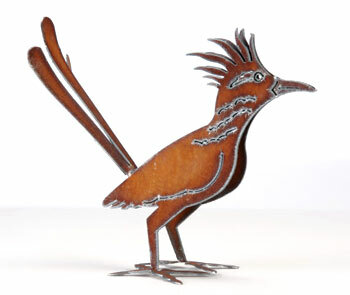 Unlike Henry Dupere's roadrunner garden sculpture, most roadrunners look somewhat like feathery dinosaurs. Henry Dupere Roadrunner Garden Sculpture. Size: 13" tall x 17" long. Three-dimensional rusted metal roadrunner garden sculpture.